Rome is hot this week, so the less cooking the better. Greek salad, caprese, prosciutto e melone, watermelon, lentil salads, peaches…. What to make for dinner? Wandering through our local supermarket, I met up with my husband, who was chatting to the cheese guy there, both looking at a large opaque bag. “Sfoglia di mozzarella”, said the cheese guy. A sheet of mozzarella? What to do you DO with that? So he told us: speck, rughetta, pomodorini, sale, pepe, olio. Layer, dress, roll, rest, slice and serve. Let’s try, we thought. Always fun to try something new. 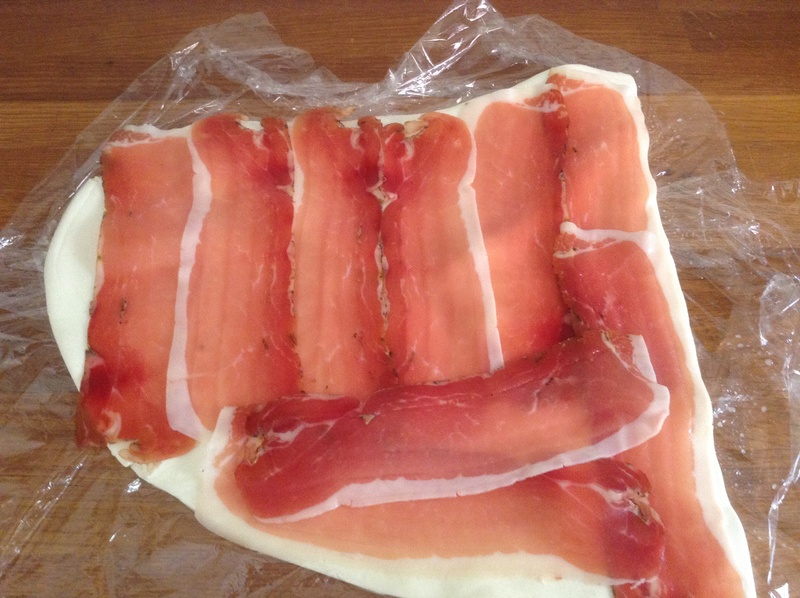 Layering on speck, about 200 grammes? One packet. This is a cured, smoked ham. Like prosciutto, but not quite the same. Rughetta and pomodorini added in, with a sprinkle of salt and pepper, and a little olive oil. 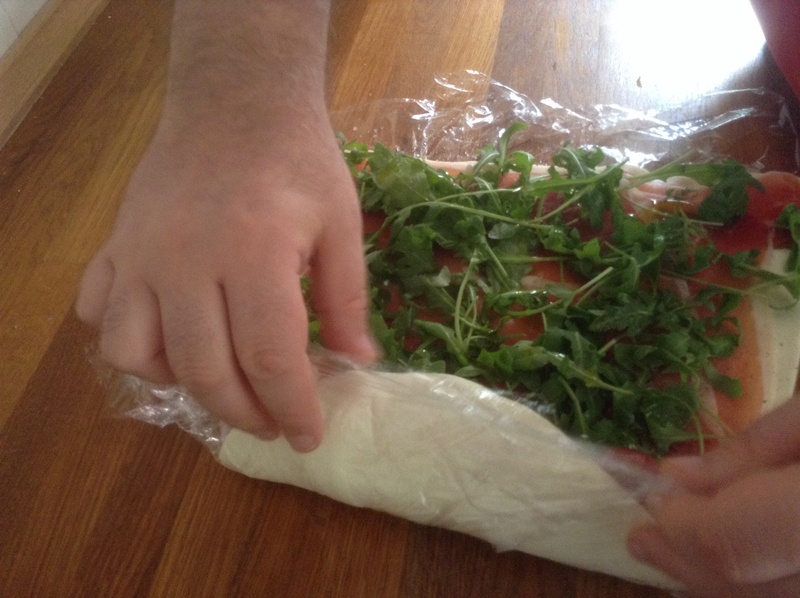 …… Then we rolled up the sheet, as if rolling a jelly roll or cinnamon bun dough. It probably should have been tighter, as the tomatoes were escaping on the edges. 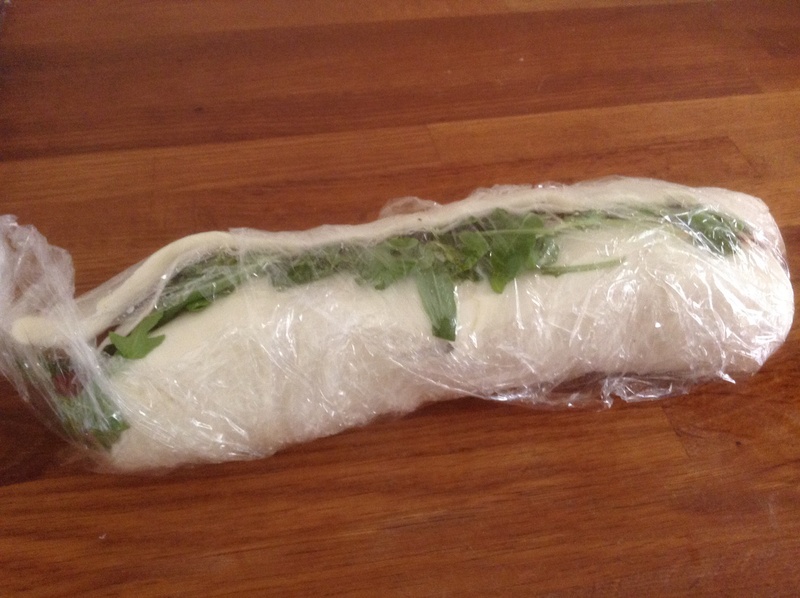 Here it is, all wrapped up in clingfilm to rest in the fridge for a couple hours. Sliced and ready to serve for antipasto. Rather fun! I had seen this in restaurants, but never made it before. This was not amazing mozzarella, but good as a cold starter, and a change from the usual insalata caprese, which is always lovely. 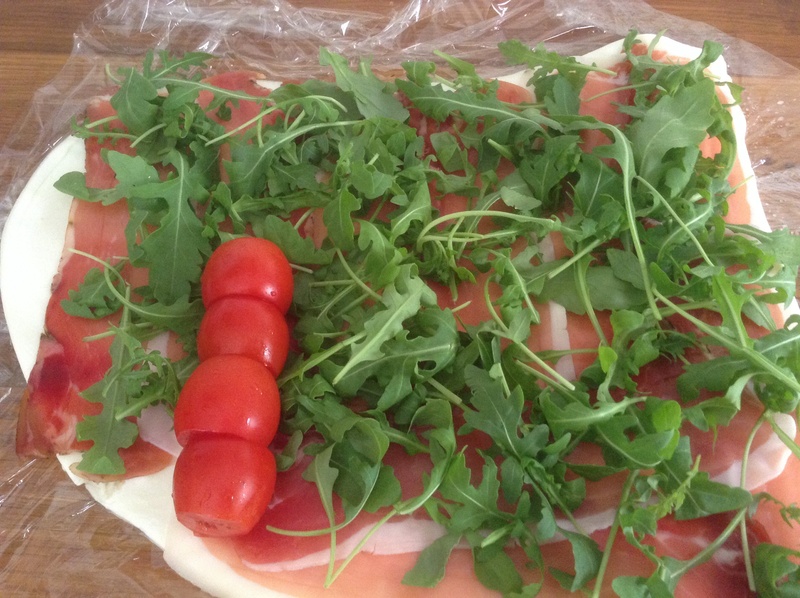 The sheet of mozzarella can be used with a variety of fillings, like tuna, salmon or radicchio. 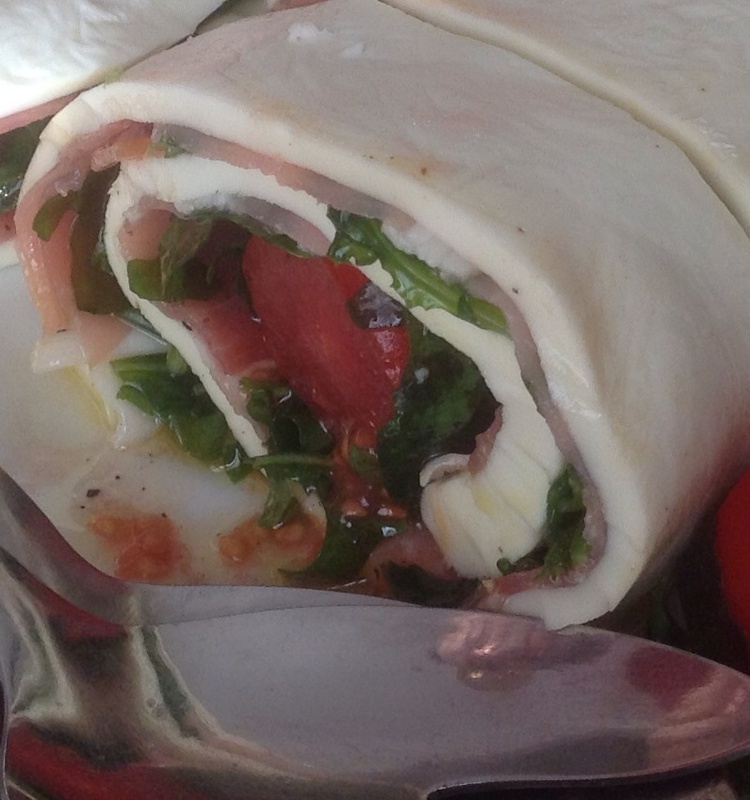 Notes: Depending on the filling, the mozzarella roll can also be heated before serving. I may try that when the summer heat has passed. If you can find some, have a go. 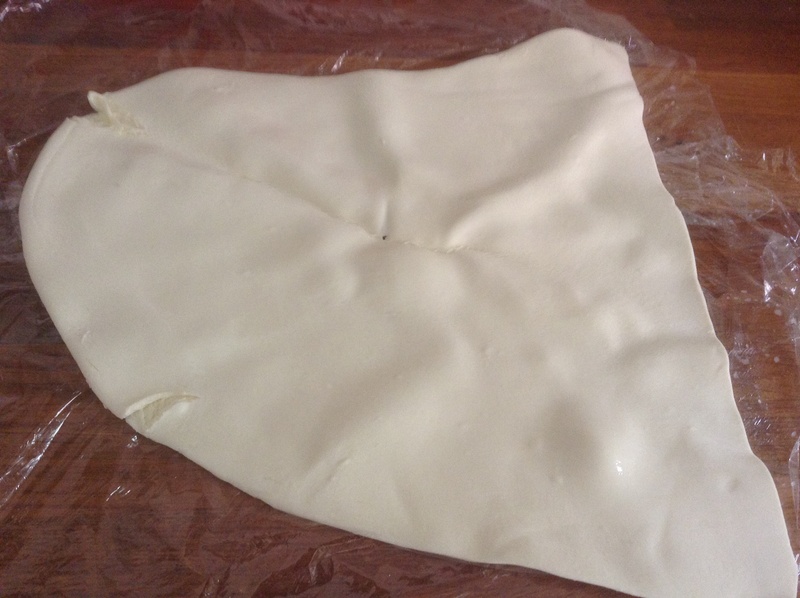 Otherwise In cucina di Paola (in Italian) describes making the mozzarella sheet yourself: heat a ball of mozzarella in microwave or bain-marie, lay it between two sheets of baking parchment, and roll it out with a rolling pin. Very interesting! This experiment is my contribution to Fiesta Friday 25, with many thanks to the hosts. Gorgeous selection of offerings there as usual! 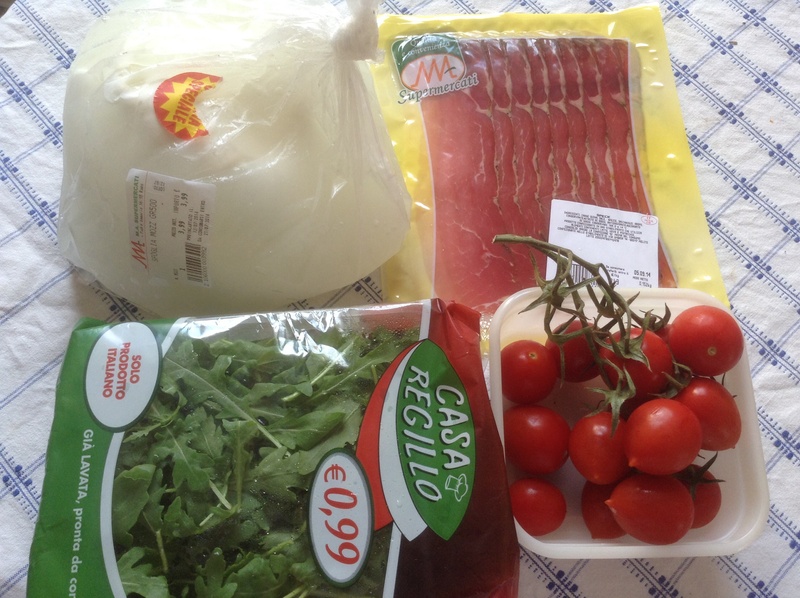 This entry was posted in food, Rome and tagged Fiesta Friday, food shopping, mozzarella on July 19, 2014 by krumkaker. 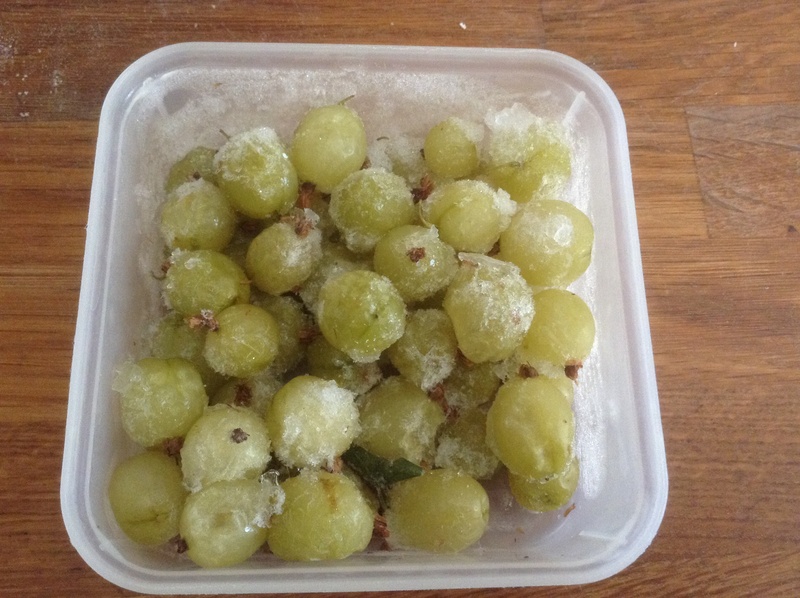 My Great Freezer Clear-out of 2014 continues, and I unearthed some ice-laden gooseberries and raspberries. Smoothie? Over yoghurt? No, a cake of some sorts…. Rome has been strangely cool this July, so baking is still manageable. Let’s see….. Aha! I had this lovely one bookmarked: From Hovkonditorn, Berry almond cheesecake, so here is a variation of that. Really nice, not too sweet, and the streusel was crispy the next day as well. Add flours, oats, and brown sugar to a bowl, then add the diced butter and add the water, cutting through pastry with a fork until crumbs are formed. Set aside a quarter of the crumb mixture for the topping. A 22 cm tart works well. 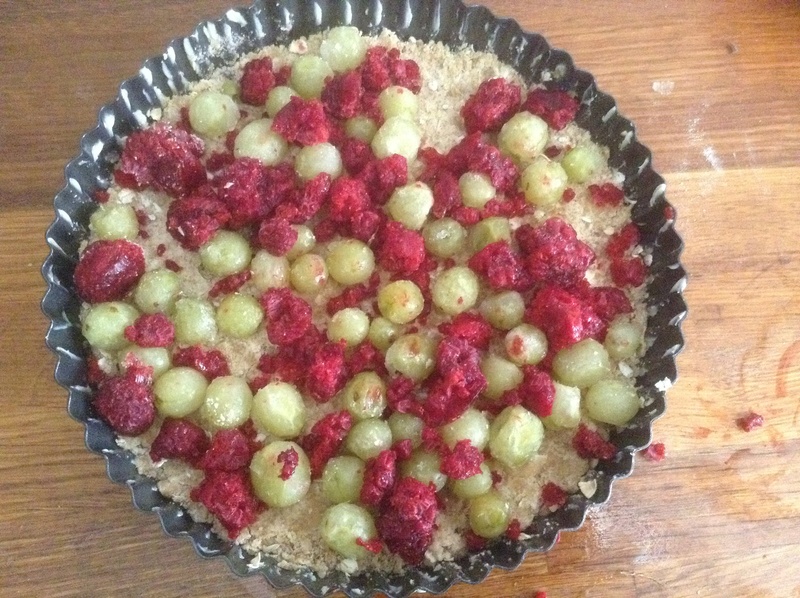 Press the remaining 3/4 of the mixture into the tart pan. I used baking parchment for the base. No need to pre-bake. Filling: beat the cream cheese and sugar. Add the egg, salt, and vanilla, then beat again until all is well combined. Sprinkle the berries on base: mine were still frozen. Pour filling over, then distribute last quarter of streusel across the top of the filling. Bake at 180C for 40-45 minutes, it will feel set. Cool and refrigerate for at least two hours before serving. 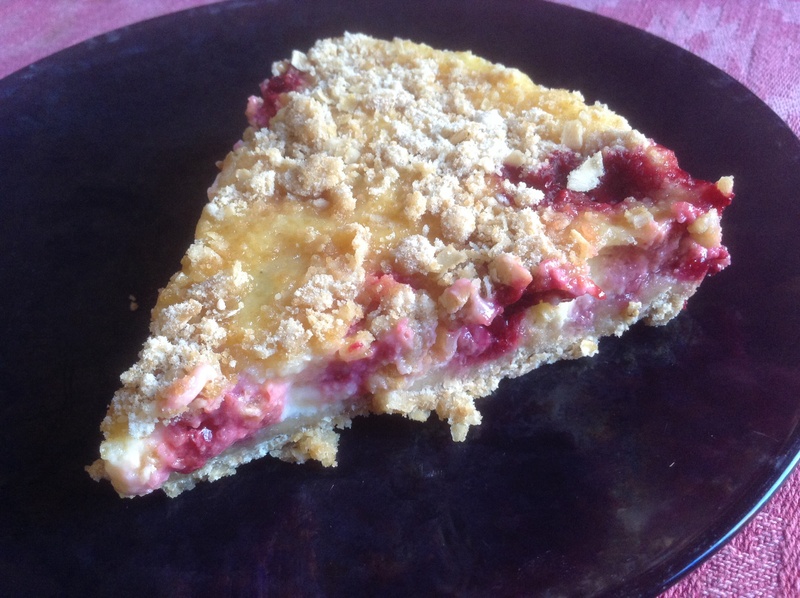 Notes: the base/streusel was really easy to make, I will use that again. I added some wholewheat flour and decreased the sugar from the original, it was tasty. I thought the frozen berries might cause problems with moisture balance in the filling, but it set well. Perhaps more oats in the streusel next time? 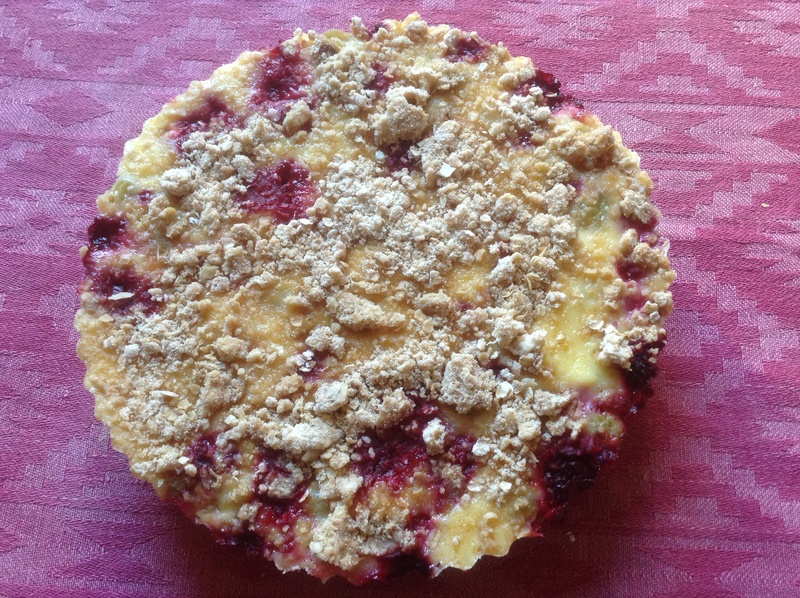 This entry was posted in baking, food and tagged berries, cheesecake on July 16, 2014 by krumkaker. No need to peel the apricots. 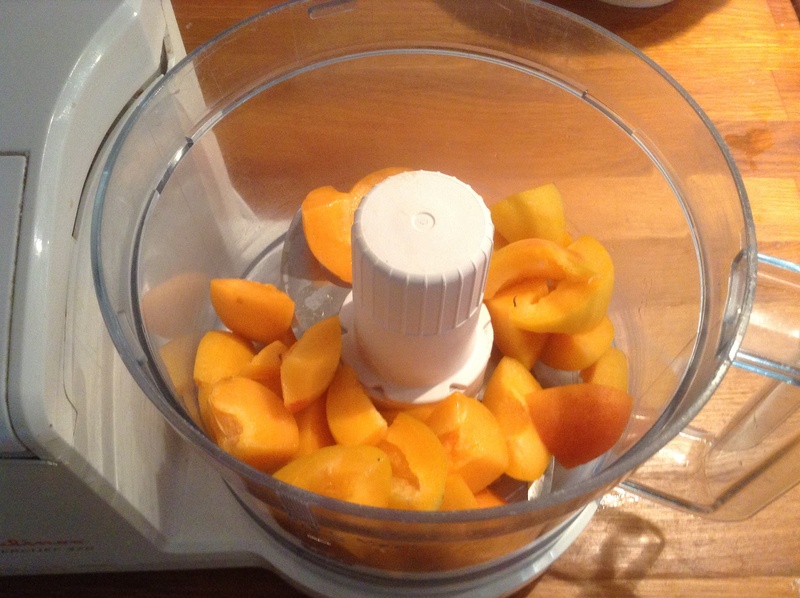 Wash, pit and roughly chop the apricots, then puré them. Add milk, sugar and honey, and mix well. Pour mixture into your gelato maker, and let it churn until the gelato has thickened and frozen. I have a Kitchenaid icecream attachment, one of those bowls you first freeze. Ideally your kitchen would not be 30C this day, but we do the best we can…. Eventually the mixture was almost frozen, so we spooned some into wine glasses and froze the rest. That’s it! Enjoy! If you do not have an ice cream contraption, spoon the mixture into a plastic container and pop it in the fridge, stirring a few times over the next couple hours while it freezes. 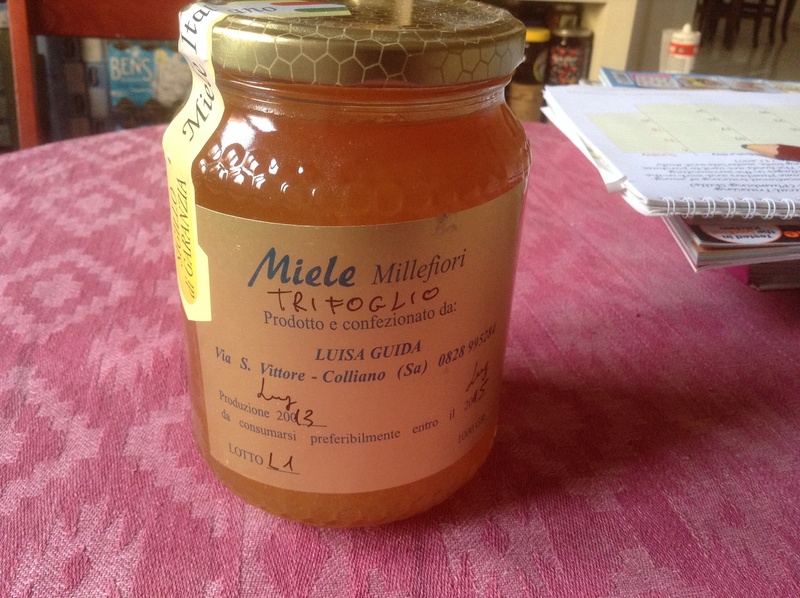 Clover honey, bought last year while on holidays in San Marco Castellabate. Notes: I really fancied gelato, but with a hot Rome kitchen I could not face roasting or cooking the apricots, or going out for cream/ricotta/mascarpone. 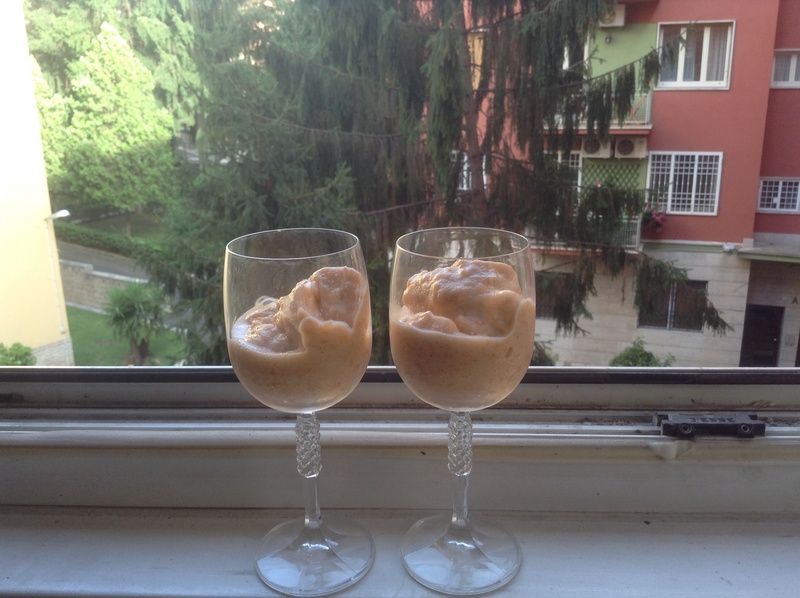 So this is adapted from Gluttony Loves Company Homemade Apricot Gelato, which looked great. I decreased the sugar overall and added honey: Chop, blend, freeze. Hey presto! Great apricot flavour. 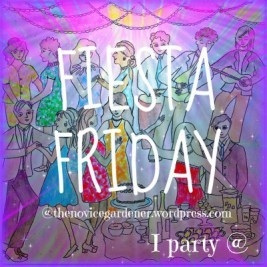 Now I am going to sample some more Fiesta Friday deliciousness. What a wonderful spread! 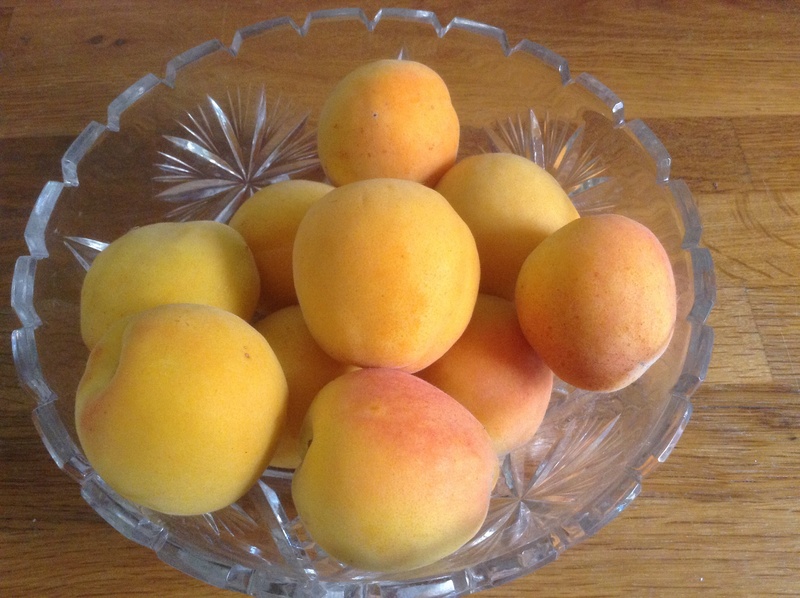 This entry was posted in food, fruit and tagged apricots, Fiesta Friday, gelato, honey on July 11, 2014 by krumkaker.